We’ve been very busy at Widow Maker Industries the past few months. Sales have been rockin’, especially our international sales. We’re excited to announce that our website is being updated to include an easier to use shopping cart with a number of new product categories. 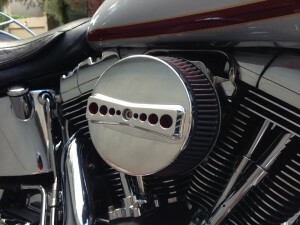 We’re still offering our 8 different jockey shift kits (each in black or chrome). And, we now have our new CNC machined Billet Aluminum air cleaner caps that fit K&N filters and match our shift levers (see the attached snap shot). They’re available in black powder coat or polished aluminum. We’ll also be offering “speed hole” brake and clutch levers to match our shifters and air cleaner caps, and “correct length” clutch cables for all model applications. We’d like to showcase some of our customer’s bikes on our new website. If you’d like to email us some photos of your bike showing your Widow Maker Jockey Shift, we may add it to our website. Thanks again for all your support. We’ll let you know when the new site is up and running.